...with a casual stroll up 5th Avenue, with a plan to try on a few watches. Specifically, to see if the 42mm Explorer II would look too large for my wrist. You know, just out of mere curiosity. I have an old 14060 that I love, but I've been wanting to add a newer Rolex to my [small] collection, one with all of the updates they've made in recent years - bracelet, clasp, case size, etc. But after trying it on, along with a few others, I knew that I would never rest until I had the Explorer II. The size, the robust build, the striking white dial...it just pulled me in, I was helpless against it. It felt like it was at home on my wrist. 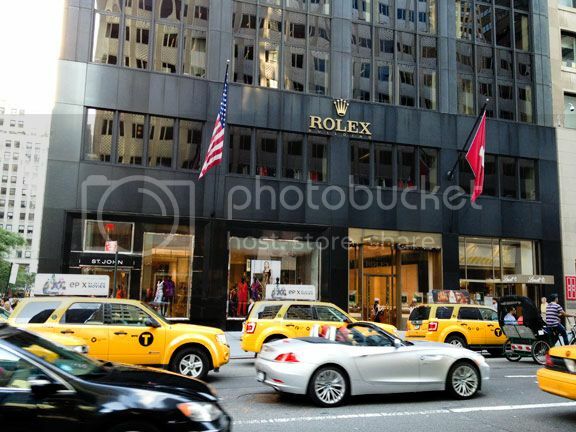 So, I soon found myself walking back out onto 5th Ave with a shopping bag in hand and a new Explorer II on wrist. What an amazing watch! Thanks to all here who have posted regarding the ExpII, you've helped me make my decision. Have a great weekend all! Previous Topic: It's move day! Wish me luck.